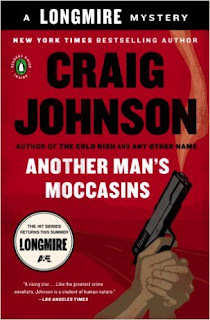 Another Man's Moccasins (Longmire Mysteries #4) by Craig Johnson is available at Amazon, Barnes and Noble, and BooksAMillion. A murder victim might connect to Walt’s past in this enthralling novel from the New York Times bestselling author of The Cold Dish and As the Crow Flies, the fourth in the Longmire Mystery Series, the basis for LONGMIRE, the hit A&E original drama series. Fans of Ace Atkins, Nevada Barr and Robert B. Parker will love the fourth mystery in New York Times bestselling author Craig Johnson's award-winning Longmire Mystery Series, the basis for LONGMIRE, the hit A&E original drama series, is not to be missed. It delivers more of the taut prose, engrossing characters, beautiful Wyoming setting, and satisfying depth that reviewers have been hailing since his first book, The Cold Dish. In Another Man's Moccasins, the body of a Vietnamese woman dumped along the Wyoming interstate opens a baffling case for Sheriff Longmire, whose only suspect is a Crow Indian with a troubled past. But things get even stranger when a photograph turns up in the victim's purse that ties her murder to one from Longmire's past-a case he tackled as a Marine Corps investigator forty years earlier in Vietnam. I've mentioned in previous reviews that the show is true to the books in the same way that Midsomer Murders was true to Caroline Graham's books: the show captures the essence of the characters but takes liberties with plots, which keeps both formats fresh for viewers. I have also noted that the third book in the series, Kindness Goes Unpunished, is the book that will throw off readers who want the show and book-series to be exactly the same. Those deviations between the book-series and show continue to grow with this book. We get two cases for the price of one in this book. We see Walt in action as a young man in the Vietnam War while he's working on a case that relates to a modern-day murder back in Absaroka County, Wyoming. This passing back and forth through time allows readers insight into Walt's life that the show has yet to capture, showing us the life experiences that shaped Walt Longmire into the man the man that we know. And the show, no matter how awesome it is, can't give us the thought processes that go on in Walt's head the way that this book does - it's impossible. I wish the show could, because I love Walt in the books a lot more than I love Walt on the show.